This article is about the stadium that opened in 2009. For the original stadium, see Yankee Stadium (1923). For other uses, see Yankee Stadium (disambiguation). Tishman Speyer/International Facilities Group, LLC. Yankee Stadium is a stadium located in the Bronx, a borough of New York City. It serves as the home ballpark for the New York Yankees of Major League Baseball (MLB), and the home stadium of New York City FC of Major League Soccer (MLS). The $2.3 billion stadium, built with $1.2 billion in public subsidies, replaced the original Yankee Stadium in 2009. It is one block north of the original, on the 24-acre former site of Macombs Dam Park; the 8-acre site of the original stadium is now a public park called Heritage Field. The stadium incorporates replicas of some design elements from the original Yankee Stadium and like its predecessor it has hosted additional events, including college football games, soccer matches, and concerts. Although Yankee Stadium's construction began in August 2006, the project spanned many years and faced many controversies, including the high public cost and the loss of public parkland. The overall price tag makes the new Yankee Stadium the most expensive stadium ever built. New York Yankees owner George Steinbrenner began campaigning for a new stadium in the early 1980s, just a few years after the remodeled Yankee Stadium opened. Steinbrenner at the time was reportedly considering a move to the Meadowlands Sports Complex in New Jersey. Governor Thomas Kean in 1984 authorized the use of land for a new baseball stadium in the Meadowlands, but the state legislature did not provide financing for the stadium. In a statewide referendum in 1987, New Jersey taxpayers rejected $185 million in public financing for a baseball stadium for the Yankees. Despite the rejection from New Jersey, Steinbrenner frequently used a threatened move there as leverage in negotiations with New York City. In 1988, Mayor Ed Koch agreed to have city taxpayers spend $90 million on a second renovation of Yankee Stadium that included luxury boxes and restaurants inside the stadium and parking garages and traffic improvements outside. Steinbrenner agreed in principle, but then backed out of the deal. In 1993, Mayor David Dinkins expanded on Koch's proposal by offering his Bronx Center vision for the neighborhood, including new housing, a new courthouse, and relocating the Police Academy nearby. In 1993, New York Governor Mario Cuomo proposed using the West Side Yard, a 30-acre rail yard along the West Side of Manhattan and owned by the Metropolitan Transportation Authority, as the location for new stadium for the Yankees. However, Cuomo lost his re-election bid a few months later. By 1995, Steinbrenner had rejected 13 proposals to keep the Yankees in the Bronx. In 1998, Bronx Borough President Fernando Ferrer proposed spending $600 million in public money to add dozens of luxury boxes to the stadium, to improve highway and public transportation access, and to create a Yankee Village, with shops, restaurants, and a museum. Steinbrenner rejected this as well. That same year, Mayor Rudy Giuliani unveiled a plan to relocate the Yankees to the West Side Yard for a $1 billion stadium. However, with most of the funding coming from taxpayers, Giuliani tabled the proposal, fearing rejection in a citywide referendum. 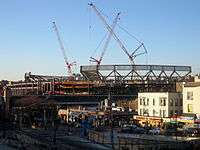 The West Side Stadium plan resurfaced in December 2001, and by January 2002, months after the September 11 attacks, Giuliani announced "tentative agreements" for both the New York Yankees and New York Mets to build new stadiums. He estimated that both stadiums would cost $2 billion, with city and state taxpayers contributing $1.2 billion. Michael Bloomberg, who succeeded Giuliani as mayor in 2002, called the former mayor's agreements "corporate welfare" and exercised the escape clause in the agreements to back out of both deals, saying that the city could not afford to build new stadiums for the Yankees and Mets. Bloomberg said that Giuliani had inserted a clause in this deal which loosened the teams' leases with the city and would allow the Yankees and Mets to leave the city on 60 days' notice to find a new home elsewhere if the city backed out of the agreement. At the time, Bloomberg said that publicly funded stadiums were a poor investment. Bloomberg's blueprint for the stadium was unveiled in 2004, at the same time as the plan for the Mets' new stadium, Citi Field. The final cost for the two stadiums was more than $3.1 billion; taxpayer subsidies accounted for $1.8 billion. Groundbreaking ceremonies for the stadium took place on August 16, 2006, the 58th anniversary of Babe Ruth's death, with Steinbrenner, Bloomberg and then-Governor of New York George Pataki among the notables donning Yankees hard hats and wielding ceremonial shovels to mark the occasion. The Yankees continued to play in the previous Yankee Stadium during the 2007 and 2008 seasons while their new home stadium was built across the street. The community was left without parkland for five years. During construction of the new stadium, a construction worker and avid Boston Red Sox fan buried a replica jersey of Red Sox player David Ortiz underneath the visitors' dugout with the objective of placing a "hex" on the Yankees, much like the "Curse of the Bambino" that had allegedly plagued the Red Sox long after trading Ruth to the Yankees. After the worker was exposed by co-workers, he was forced to help exhume the jersey. The Yankees organization then donated the retrieved jersey to the Jimmy Fund, a charity started in 1948 by the Red Sox' National League rivals, the Boston Braves, but long championed by the Red Sox and particularly associated with Ted Williams. The worker has since claimed to have buried a 2004 American League Championship Series program/scorecard, but has not said where he placed it. These attempts didn't have much effect upon the home team, though: the Yankees went on to win the 2009 World Series at the end of their first MLB season in the new stadium. The new stadium is meant to evoke elements of the original Yankee Stadium, both in its original 1923 state and its post-renovation state in 1976. The exterior resembles the original look of the 1923 Yankee Stadium. The interior, a modern ballpark with greater space and increased amenities, features a playing field that closely mimics the 1988–2008 dimensions of the old stadium. The current stadium features 4,300 club seats and 68 luxury suites. The stadium was designed by the architectural firm Populous. The exterior was made from 11,000 pieces of Indiana limestone, along with granite and pre-cast concrete. It features the building's name V-cut and gold-leaf lettered above each gate. The interior of the stadium is adorned with hundreds of photographs capturing the history of the Yankees. The New York Daily News newspaper partnered with the Yankees for the exhibition "The Glory of the Yankees Photo Collection", which was selected from the Daily News' collection of over 2,000 photographs. Sports & The Arts was hired by the Yankees to curate the nearly 1,300 photographs that adorn the building from sources including the Daily News, Getty Images, the Baseball Hall of Fame and Major League Baseball. The seats are laid out similar to the original stadium's stands, with grandstand seating that stretches beyond the foul poles, as well as bleacher seats beyond the outfield fences. The Field Level and Main Level comprise the lower bowl, with suites on the H&R Block Level, and the Upper Level and Grandstand Level comprising the upper bowl. Approximately ⅔ of the stadium's seating is in the lower bowl, the inverse from the original Yankee Stadium. 50,287 fans can be seated, with a standing room capacity of 52,325. The new stadium's seating is spaced outward in a bowl, unlike the stacked-tiers design at the old stadium. This design places most fans farther back but lower to the field, by about an average of 30 feet (9.1 m). Over 56 suites are located within the ballpark, triple the amount from the previous stadium. Seats are 19–24 inches (48–61 cm) wide, up from the previous stadium's 18–22-inch (46–56 cm) wide seats, while there is 33–39 inches (84–99 cm) of leg room, up from 29.5 inches (75 cm) of leg room in the previous stadium. Many lower level seats are cushioned, while all seats are equipped with cupholders. To allow for the extra seating space, the stadium's capacity is reduced by more than 4,000 seats in comparison to the previous stadium. Many design elements of the ballpark's interior are inspired by the original Yankee Stadium. The roof of the new facility features a replica of the frieze that was a trademark of the previous ballpark. In the original Yankee Stadium, a copper frieze originally lined the roof of the upper deck stands, but it was torn down during the 1974–75 renovations and replicated atop the wall beyond the bleachers. The new stadium replicates the frieze in its original location along the upper deck stands. Made of steel coated with zinc for rust protection, it is part of the support system for the cantilevers holding up the top deck and the lighting on the roof. The wall beyond the bleacher seats is "cut out" to reveal the 4 subway trains as they pass by, like they were in the original facility. A manually operated auxiliary scoreboard is built into the left and right field fences, in the same locations it existed in the pre-renovation iteration of the original Yankee Stadium. Between the exterior perimeter wall and interior of the stadium is the "Great Hall", a large concourse that runs between Gates 4 and 6. 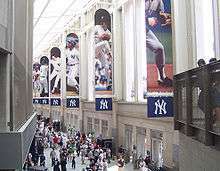 With seven-story ceilings, the Great Hall features more than 31,000 square feet (2,900 m2) of retail space and is lined with 20 banners of past and present Yankees superstars. The Great Hall features a 5-by-383-foot (1.5 by 116.7 m) LED (light-emitting diode) ribbon display as well as a 25' by 36' LED video display above the entrance to the ballpark from Daktronics, a company in Brookings, South Dakota. Monument Park, which features the Yankees' retired numbers, as well as monuments and plaques dedicated to distinguished Yankees, has been moved from its location beyond the left field fences in the original Yankee Stadium to its new location beyond the center field fences at the new facility. The newly relocated Monument Park is now situated under the sports bar; black shades cover the monuments on the back wall during games to prevent interference with the vision of the batter. The new location of the monuments is meant to mirror their original placement in center field at the original pre-renovation Yankee Stadium, albeit when they were on the playing field. The transfer of Monument Park from the old stadium to the new stadium began on November 10, 2008. The first monuments were put in place on February 23, 2009. Yankees pitcher Mariano Rivera requested that the Yankees reposition the team's bullpen, as well as add a door to connect the Yankees' bullpen to Monument Park, in order to allow access to it by Yankee relievers. The organization complied with his request. The field dimensions for the outfield fences have the same distance markers as the original facility prior to closing yet the dimensions are not identical. Due to the design of the right-field stands and the inclusion of an embedded manual scoreboard, the right-field wall is an average of 5 feet (1.5 m) closer to home plate. Overall, the fences measure 318 feet (97 m) to left field, 399 feet (122 m) to left-center field, 408 feet (124 m) to center field, 385 feet (117 m) to right-center field, and 314 to right field. At the old Yankee Stadium, the right field wall curved from the right-field corner to straightaway center, while at the new ballpark the fence takes a sharp, almost entirely straight angle. This results in a difference at certain points between the right field markers of as much as 9 feet (2.7 m). The dimensions in left field are substantially the same despite the presence of an embedded auxiliary scoreboard there as well. The outfield fences measure 8 feet 5 inches (2.57 m) high from the left-field foul pole until the Yankees' bullpen, when the fences begin to gradually descend in height until the right field foul pole, where they are only 8 feet (2.4 m) tall. This also marks a decrease from the previous Yankee Stadium, where the outfield walls stood at a height of approximately 10 feet (3.0 m). The distance from home plate to the backstop is 52 feet 4 inches (15.95 m), a reduction of 20 feet (6.1 m) from the previous facility. The field is made up of Kentucky bluegrass, the same surface as the previous stadium, which is grown on a 1,300 acres (530 ha) farm in Bridgeton, New Jersey. The grass is equipped with a drainage system (featuring over 14,000 feet (4,300 m) of pipe) that makes the field playable an hour after taking 2 inches (51 mm) of rain. A signature by Babe Ruth is one of many autographs in the "ball wall", the centerpiece of the Yankee Museum. Yankee Stadium features a wide array of amenities. It contains 63% more space, 500,000 square feet (46,000 m2) more in total, than the previous stadium, with wider concourses and open sight lines on concourses. Along with 227 miles (365 km) of wired Ethernet cable, the building has sufficient fiber-optic cable wiring that Cisco Vice President and Treasurer David Holland calls the building "future proof". Over 1,100 high-definition video monitors are placed within the stadium and approximately $10 million worth of baseball merchandise is housed within the ballpark. The center field scoreboard, manufactured by Mitsubishi Diamond Vision, measures 59 x 101 feet (31 m) and offers 5,925 square feet (550.5 m2) of viewing area. It was the third-largest high definition scoreboard in the world when it opened (behind the 8,736-square-foot (811.6 m2) board at newly renovated Kauffman Stadium and the new 8,066-square-foot (749.4 m2) board at the renovated Tokyo Racecourse). Since then, it has also been surpassed by the world's largest scoreboard at AT&T Stadium and the new scoreboard at the Philadelphia Phillies' Citizens Bank Park. Displaying 5,925 ft (1,806 m)² of video, the scoreboard can display four 1080p high definition images simultaneously. The Yankees clubhouse features 30,000 square feet (2,880 m²) of space, over 2.5 times the space of the clubhouse from the previous facility. The dressing area alone features 3,344 sq ft (310.7 m2) of space, with each locker equipped with a safety deposit box and touch-screen computer. The Yankees clubhouse features a weight room, training room, video room, and lounge area, while both teams' clubhouses have their own indoor batting cages. The Yankees' therapy room features a hydrotherapy pool with an underwater treadmill. The Yankees are believed to be the first team to chemically treat their uniforms, as well as the showering surfaces with an anti-bacterial agent that reduces the risk of infection. The New York Yankees Museum, located on the lower level at Gate 6, displays a wide range of Yankees' memorabilia. A "Ball Wall" features hundreds of balls autographed by past and present Yankees, and there are plans to eventually add autographs for every living player who has played for the Yankees. 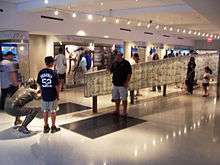 The centerpiece of the museum is a tribute to Don Larsen's perfect game in the 1956 World Series, with a commemorative home plate in the floor and statues of Larsen pitching to Yogi Berra. Along with a facsimile of a current locker from the Yankees' clubhouse, fans can view the locker of the late Thurman Munson, which sat unoccupied in the previous stadium's Yankee clubhouse in honor of Munson. The ballpark offers a wide choice of restaurants. There are 25 fixed concessions stands, along with 112 movable ones. A Hard Rock Cafe is located within the ballpark, but it is open to anyone at the 161st St. and River Ave. entrance year round. The Hard Rock Cafe at Yankee Stadium officially opened on March 30, 2009, and an opening ceremony took place on April 2, 2009. A steakhouse called NYY Steak is located beyond right field. Celebrity chefs will occasionally make appearances at the ballpark's restaurants and help prepare food for fans in premium seating over the course of the season. Above Monument Park in center field is the Mohegan Sun sports bar, whose tinted black glass acts as the ballpark's batter's eye. The sports bar obstructs the view of approximately 600 bleacher seats in the right and left field bleachers, preventing fans from seeing the action occurring deep in the opposite side of the outfield. In response, the Yankees installed TV monitors on the sides of the sports bar's outer walls, and have reduced the price of these obstructed-view seats from $12 to $5. Although Yankee Stadium has been praised for its amenities, it has been widely criticized for high ticket prices. Seats within the first eight rows in the lower bowl, called the "Legends Suite", are among the highest-priced tickets in professional sports. Tickets cost $510 on average; the most expensive tickets cost $2,600 each. Legends Suite Seats have been regularly empty, with many ticket holders in this section having given up their tickets, and others remaining unsold, despite most other seats in the ballpark selling out. This has created an embarrassing image on television of the seats behind home plate being almost completely vacant. Consequently, a surplus of tickets for Legends Seats have emerged in the secondary market, and with supply exceeding demand, resale prices have dropped. Empty seats in the Legends Suite could even be seen during the 2009 playoffs, including World Series games. Even though all playoff games were sellouts, Legends Suite ticket holders were in the lounges and the restaurant underneath instead of their seats. Overall, the average ticket price is $63, the highest in baseball. Legends Suite seats are also separate from the other lower bowl seating and are vigorously patrolled by stadium security, with the divider being described as a "concrete moat." Fans who do not have tickets within this premium section in the front rows are not allowed in the section. This includes stand behind the dugouts during batting practice and to seek autographs. The least expensive seats, the bleachers, have left many fans disappointed, as the Mohegan Sun Sports Bar in center field obstructs the views from seats on both sides, in sections 201 and 239. The Yankees responded to the complaints by installing television screens on the walls. The cost of obstructed view seats was reduced slightly. In 2015, their cost is $15, compared with $20 for the rest of the bleachers. Fans have complained that seats throughout the new stadium are farther away from the field than the old stadium, and that the upper-deck seats are at a much higher elevation. The Yankee Stadium staff was also criticized for an incident during a May 4, 2009 game, which was interrupted by a rain delay. Fans were told by some staff members that the game was unlikely to resume and consequently, many fans exited the stadium, only for the game to eventually resume play. The fans that left the ballpark were not permitted to re-enter, per the stadium's re-entry policy, and many subsequently got into arguments with stadium personnel. In response to the backlash the Yankees received for the incident, the staff members were required to sign a gag order preventing them from speaking to media, but they did indicate that communication for rain delays would be improved. Late in the stadium's first season, cracks were seen on the concrete ramps of the Stadium. The Yankees are trying to determine whether there was something wrong with the concrete, or the ramps' installation or design. The company involved in inspecting the concrete was indicted on charges that its employees either faked or failed to perform some required tests and falsified the results of others. The stadium has also been criticized for its lack of fan noise. During a Sunday Night Baseball telecast in 2012, commentator and former Red Sox manager Terry Francona spoke about the different atmospheres in the old and new stadiums saying that "As a visiting team, especially for the Red Sox, by the time the (national) anthem was over, you couldn't wait to get back in the dugout. Now (there is) a little different (kind) of fan sitting around down there by the dugout." Games at the new stadium do not feature the same deafening crowd moments and often sound eerily silent. The lack of fan noise was noticeable in the 2012 playoffs as well, with thousands of unsold seats for Game 5 of the ALDS and Games 1 and 2 of the ALCS. "This is a very easy place to play now", said Quintin Berry of the Detroit Tigers, the Yankees' ALCS opponents. "Coming from Oakland, the fans there were so rowdy. It was easier to come here." In his autobiography "The Closer", the Yankees' longtime relief pitcher Mariano Rivera wrote these comments about the new stadium's atmosphere: "It doesn’t hold noise, or home-team fervor, anywhere near the way the old place did. The old Stadium was our 10th man — a loud and frenzied cauldron of pinstriped passion, with a lot of lifers in the stands. Maybe I’m wrong, but it's hard to see that the new place can ever quite duplicate that. Derek Jeter echoed this sentiment in a September 2014 article in New York magazine, Jeter said he missed the original Yankee Stadium: "It was a different feel. The new stadium, it's second to none—all the amenities. For the players, it really doesn’t get any better. The old stadium, if you were at the stadium, in the stands, the only place you could see the game was in your seat. Now there's so many suites and places people can go. So a lot of times it looks like it's empty, but it's really not. The old stadium, it was more intimidating. The fans were right on top of you." In its first season, Yankee Stadium quickly acquired a reputation as a "bandbox" and a "launching pad" because of the high number of home runs hit at the new ballpark. Through its first 23 games, 87 home runs were hit at the venue, easily besting Enron Field's (now called Minute Maid Park) previous record set in 2000. Early in the season, Yankee Stadium was on pace to break Coors Field's 1999 single-season record of 303 home runs allowed, and the hometown Daily News (using the back-page headline "HOMERS ODYSSEY") started publishing a daily graphic comparing each stadium's home run totals through a similar number of games. ESPN commentator Peter Gammons denounced the new facility as "one of the biggest jokes in baseball" during an appearance on Mike and Mike in the Morning, and concludes that "[it] was not a very well-planned ballpark". Likewise, Gammons' ESPN colleague Buster Olney described the stadium as "a veritable wind tunnel" and likened it to his childhood Wiffle-ball park. Newsday columnist Wallace Matthews joined in the criticism, labeling the stadium "ridiculous" and accused "the franchise that took ownership of the home run" of cheapening it. He suggested that Babe Ruth could have potentially hit 120 or more homers if he played in the new Stadium. For his column, Matthews interviewed former Yankee Reggie Jackson, who termed the park "too small" to contain current player Alex Rodriguez. Jackson estimated that the park might enable the third baseman to hit 75 home runs in a season. A variety of theories have been posited to account for the dramatic increase in home runs at the new Yankee Stadium over the original stadium, foremost among these the sharper angles of the outfield walls and the speculated presence of a wind tunnel. During construction of the new ballpark, engineers commissioned a wind study, the results of which indicated there would be no noticeable difference between the two stadiums. The franchise planned a second study, but Major League rules prohibit a team from making any changes to the playing field until the off-season. An independent study by the weather service provider AccuWeather in June 2009 concluded that the shape and height of the right field wall, rather than the wind, is responsible for the proliferation of home runs at the stadium. AccuWeather's analysis found that roughly 20% of the home runs hit at the new ballpark would not have been home runs at the old ballpark due to the gentle curve of its right field corner, and its 10-foot (3.0 m) wall height. Nothing was observed in wind speeds and patterns that would account for the increase. The number of home runs hit at the new stadium slowed significantly as the season progressed, but a new single-season record for most home runs hit at a Yankee home ballpark was nonetheless set in the Yankees' 73rd home game of 2009 when Vladimir Guerrero of the Los Angeles Angels of Anaheim hit the 216th home run of the season at the venue, surpassing the previous record of 215 set at the original Yankee Stadium in 2005. However, the Yankees offense, as in previous years, had employed many home run hitters in 2009. The Yankees hit 108 home runs while playing on the road, the second most in baseball behind the Philadelphia Phillies. In 2010, the early rate of home runs were markedly less through May 15, 2010, with 35 home runs hit in 14 games for 2.5 per game (a projection of 205 – in 2009, the stadium finished at 2.93 per game for a total of 237.) Even though the stadium's home run rate decreased slightly for the 2010 season to 2.73 per game, it was still the highest figure in the majors. However, the prolific home run rate of April and May 2009 that drew criticism has not sustained itself over any season thus far, and while through the first two months of the 2011 season the Yankees hit far more homers than any other team in the majors, Yankee Stadium was not the top home run park. Before the official Opening Day against the Cleveland Indians April 16, 2009, the Yankees hosted a two-game exhibition series at the stadium in early April against the Chicago Cubs. Grady Sizemore of the Indians was the first player to hit a grand slam off of Yankee pitcher Dámaso Marte. The Indians and 2008 Cy Young Award winner, Cliff Lee, spoiled the opening of the new stadium by winning 10–2. Before the Yankees went to bat for the first time, the bat that Babe Ruth used to hit his first home run at the old Yankee Stadium in 1923 was placed momentarily on home plate. Jorge Posada hit the first Yankee home run in the new ballpark hitting his off Lee in the same game. Russell Branyan, while playing for the Seattle Mariners, was the first player to hit a home run off of the Mohegan Sun Restaurant in center field. Like its predecessor, the new Yankee Stadium hosted the World Series in its very first season; in the 2009 World Series, the Yankees defeated the Philadelphia Phillies 4 games to 2. It also became the latest stadium to host a World Series-clinching victory by its home team in the venue's first season (after the St. Louis Cardinals won the World Series at Busch Stadium in 2006), when, on November 4, 2009, the Yankees won their 27th World Series championship against the Phillies. The Yankees are the only team to inaugurate two stadiums with World Series wins and also appeared in the 1976 World Series following the refurbishment of the original Yankee Stadium, losing to the Big Red Machine in four straight. On October 6, 2011 Detroit Tigers in game five of the ALDS were the first team to eliminate the Yankees at the new Yankee Stadium in the postseason. Many historic milestones and records have been achieved at Yankee Stadium. In 2009, Derek Jeter became the Yankees all-time hits leader with his 2,722nd hit, surpassing Lou Gehrig's 72-year record. The following season, Alex Rodriguez hit his 600th home run at the Stadium, becoming the youngest player to accomplish the feat. In 2011, three significant milestones were achieved at the stadium. In July, Jeter became the first Yankee to join the 3,000 hit club and collect all 3,000 hits with the franchise. The following month, the Yankees became the first team in history to hit three grand slams in a single game. As the regular season drew to a close, Mariano Rivera became the all-time leader in regular season saves, when he earned his 602nd save. On April 20, 2016, the Oakland Athletics' Kendall Graveman became the first starting pitcher to bat at Yankee Stadium. The stadium is serviced via subway by the 161st Street station on the IRT Jerome Avenue Line (shown) as well as the IND Concourse Line (underground, not shown). Commuter railroad service is provided by the East 153rd Street Metro-North Railroad station. The stadium is reachable via the 161st Street – Yankee Stadium station complex, the same that served the old Yankee Stadium, by the 4 B D trains of the New York City Subway. It is also served by the Yankees – East 153rd Street station of the Metro-North Railroad, opened on May 23, 2009; this station routinely features Hudson Line train service, but on game days, Harlem Line and New Haven Line trains from upstate New York and Connecticut – as well as shuttle trains from Grand Central Terminal also stop there. 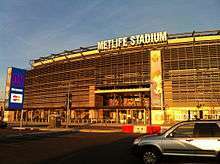 The stadium is also served by the Bx1, Bx2, Bx6, and Bx13 New York City Bus routes. 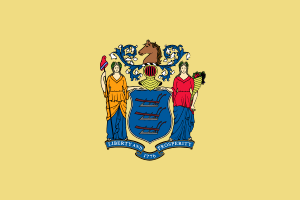 For selected games, SeaStreak provides high-speed ferry service to Highlands, New Jersey. Yankee Stadium is accessible by car via the Major Deegan Expressway (I-87), with connections to the Cross Bronx Expressway (I-95), Bruckner Expressway (I-278), and other highways and roads. Aside from existing parking lots and garages serving the stadium, construction for additional parking garages is planned. The New York State Legislature agreed to $70 million in subsidies for a $320 million parking garage project. On October 9, 2007, the New York City Industrial Development Agency approved $225 million in tax-exempt bonds to finance construction of three new parking garages that will have 3,600 new parking spaces, and renovation of the existing 5,569 parking spaces nearby. Plans initially called for a fourth new garage, but this was eliminated before the final approval. The garages will be built (and renovated) by the Community Initiatives Development Corporation of Hudson, New York, a nonprofit entity that will use the parking revenue to repay the bonds and pay a $3 million yearly land lease to the City of New York. Parking is expected to cost $25 per game. Yankee Stadium hosting a New York City FC soccer match in 2015. As part of the 2012 World Football Challenge, Chelsea played with Paris Saint-Germain on July 22, 2012 in the first soccer match at Yankee Stadium, the match ended in a 1–1 tie, before a crowd of 38,202. The Stadium hosted another soccer match between A.C. Milan and Real Madrid on August 8, 2012. Real Madrid won 5-1, before a crowd of 49,474. Chelsea also played Manchester City there on May 25, 2013, which ended in a 5-3 win for City. 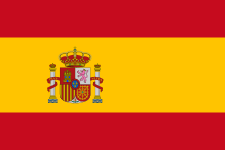 On June 11, 2013, Spain defeated the Republic of Ireland 2-0 in a friendly match at the stadium. 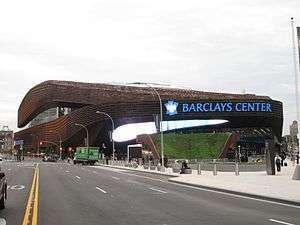 On April 21, 2014, it was announced that New York City FC, a Major League Soccer expansion team owned jointly by the New York Yankees and Manchester City, would play in Yankee Stadium from 2015 until their new stadium is completed. NYCFC played their first game at Yankee Stadium on March 15, 2015. Because of the unique dimensions of the Yankee Stadium field, the playing surface of the soccer pitch is 110 yards long by 70 yards wide — the smallest field in all of Major League Soccer, and the smallest allowed by FIFA's international guidelines. 000000002010-09-13-0000September 13, 2010 Jay-Z and Eminem + B.o.B and J. Cole The Home & Home Tour Special guests with Eminem: D12, B.o.B, 50 Cent, Lloyd Banks and Dr. Dre. Special guests with Jay-Z: Kanye West, Nicki Minaj, Swizz Beatz, Eminem, Chris Martin of Coldplay, Drake, Beyoncé and Bridget Kelly. 000000002010-09-14-0000September 14, 2010 Special guests with Eminem: D12, B.o.B, 50 Cent, G-Unit and Dr. Dre. Special guests with Jay-Z: Kanye West, Nicki Minaj, Swizz Beatz, Eminem, Mary J. Blige, Drake, Beyoncé. 000000002011-07-16-0000July 16, 2011 Special guest: Billy Joel. 000000002011-09-14-0000September 14, 2011 Metallica, Slayer, Megadeth and Anthrax Big Four 41,762 Concert by the "Big Four" of thrash metal. (total) Surprise guest: Alicia Keys. 000000002013-07-20-0000July 20, 2013 Surprise guest: Timbaland. (total) Surprise guest: Tego Calderón, Bernie Williams, Luis Vargas, Antony Santos, and Fefita La Grande. 000000002014-07-12-0000July 12, 2014 Surprise guest: Bernie Williams, Prince Royce, Marc Anthony and Aventura reunion. The first non-baseball event at the current version of Yankee Stadium took place on the evening of Saturday, April 25, 2009, when Senior Pastor Joel Osteen of Lakewood Church held what was dubbed as a "Historic Night of Hope" Christian prayer service. A New York University graduation ceremony took place on May 13, 2009 with the address being delivered by U.S. Secretary of State and former New York Senator Hillary Clinton. The 2010 NYU ceremony featured alumnus Alec Baldwin as a speaker. President Bill Clinton spoke at the 2011 ceremony. The promotional tour for the Manny Pacquiao–Miguel Cotto fight began with an event at Yankee Stadium on September 10, 2009. On June 5, 2010, Yuri Foreman fought Cotto in the first boxing match in The Bronx since 1976. The fight was referred to as the "Stadium Slugfest". Cotto defeated Foreman with a TKO in the ninth round. Cotto captured the WBA super welterweight title and his fourth world title, before a crowd of 20,272. The Notre Dame Fighting Irish played a college football game at Yankee Stadium against The Army Black Knights on November 20, 2010, with the Irish defeating the Black Knights 27–3. This marked the two teams' first meeting in the Bronx since 1969. Army played Rutgers in 2011 (Rutgers defeated Army 27–12), and played against Connecticut in 2014. Also in 2014, Lehigh and Lafayette played the 150th edition of their college football rivalry game at Yankee Stadium on November 22, 2014. Both teams played to a sold out stadium; Lafayette winning, 27-7. 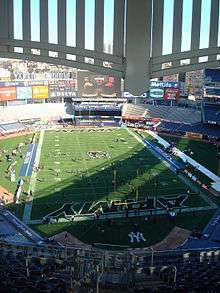 Yankee Stadium hosted the newly created Pinstripe Bowl, an annual college football bowl game that pitted Syracuse (3rd place Big East) against Kansas State (7th place Big 12) on December 30, 2010. Syracuse defeated Kansas State 36–34 in a shootout, before a crowd of 38,274. The first National Hockey League event took place on January 26, 2014 between the New York Rangers and the New Jersey Devils as part of the 2014 NHL Stadium Series. The Rangers also faced off against the New York Islanders on January 29, 2014 under the deep cold outdoor weather. The Rangers won both matches 7-3 and 2-1 respectively. Both games were expected to draw spectators at almost the full capacity of the stadium at 50,000 people. The Devils and Islanders never played an outdoor game before this series. On November 4, 2017, Yankee Stadium will host a college wrestling match between Big Ten Conference rivals Rutgers and Maryland. Effective 2016, printed electronic tickets can not be used at New York Yankees and New York City FC matches at Yankee Stadium. Only traditional hard-stock tickets, and those issued via a mobile ticketing system, are accepted. The team justified the decision by stating that it was meant to combat fraud associated with printed digital tickets. However, it was also believed that the team was trying to specifically hinder the ticket resale service StubHub, which competed against an official resale service run by TicketMaster known as the Yankees Ticket Exchange. The YTE is subject to a price flooring policy, meaning that tickets may only be discounted up to a certain amount. Although StubHub is the official ticket resale partner of Major League Baseball, the Yankees, as well as the Los Angeles Angels and Chicago Cubs, had opted out of this agreement. Owing to the Yankees' ownership of the team, New York City FC announced on March 11, 2016 that its matches would also be subject to this policy. At the team's March 13, 2016 home opener, although the team stated that they would be phasing in mobile ticketing by introducing additional verification steps for printed tickets before the policy takes full effect in April, reports indicated that the stadium was turning away fans with printed tickets, leading to long queue lines, as well as few attendees inside the stadium itself. 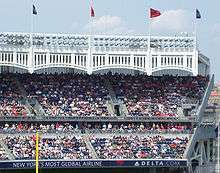 In an interview with WFAN radio, Yankees COO Lonn Trost explained that the measures were to help combat ticket resale, arguing that the team did not want fans to purchase "premium" seats at bargain prices, because they would be filled by "someone who has never sat in a premium location [before]". On the April 3, 2016 episode of the HBO news-comedy series Last Week Tonight, host John Oliver responded to Trost's remarks, arguing that he was "saying that rich people couldn't bear to sit next to people who aren't as rich." As a further satire of Trost's arguments against discounted resale, Oliver then announced a contest in which viewers were invited to send photos of themselves dressed as if they had "never sat in a premium location before", with winners offered the ability to purchase a pair of Legends Seats from one of the first home three games of the season for 25 cents. The stunt was successful, leading to the presence of several costumed attendees in Legends Seats during the opening games. Team president Randy Levine responded positively to the stunt, thanking Oliver for having bought tickets to begin with, and remarked that everyone was welcome at Yankee Stadium. On June 27, 2016, the Yankees announced that it had reached a deal with StubHub for it to become its new official ticket resale partner beginning on July 7, 2016, and allow season ticket holders to sell electronic tickets, rather than mail physical tickets to the buyer. The service will still be subject to a price flooring policy, but the team stated that the new arrangement would provide a "superior, more secure, [and] better experience". ↑ Rashbaum, William. "Cracks Emerge in Ramps at New Yankee Stadium". New York Times. Retrieved 19 November 2014. ↑ "The House That Jeter Built". MLB.com. Retrieved 19 November 2014. ↑ "New York Yankees on the Forbes MLB Team Valuations List". Forbes. March 25, 2015. Archived from the original on June 4, 2015. Retrieved April 11, 2016. ↑ Marchand, Andrew; Matthews, Wallace (March 25, 2014). "Question 4: Will Jeter Lure 4 Million Fans?". ESPN. Retrieved March 26, 2014. ↑ Perrotto, John (October 12, 2012). "Yankee Stadium Sea of Blue – Empty Seats – at Game Time". USA Today. Retrieved March 16, 2013. ↑ Shpigel, Ben (October 14, 2010). "Vazquez's Final Pitch in Pinstripes?". The New York Times. Retrieved April 17, 2014. 1 2 3 "New York City FC outline plans for Yankee Stadium's baseball-to-soccer conversion". Major League Soccer. April 21, 2014. Retrieved April 21, 2014. ↑ "Notre Dame Shut Downs Army, Rolls In New Yankee Stadium Debut". University of Notre Dame Official Athletic Site. Associated Press. November 20, 2010. Retrieved November 20, 2010. ↑ "Tigers Beat Yankees 3-2, Head to ALCS vs Texas". Sports Illustrated. Associated Press. October 6, 2011. Retrieved March 16, 2013. ↑ "Yankee Stadium". Populous. Retrieved March 10, 2013. 1 2 Scarangello, Thomas Z.; Squarzini, Michael J. (July 2009). "New Yankee Stadium respects its rich history". Structural Engineer. Retrieved September 19, 2011. ↑ "Yankee Stadium". Ballparks Munsey and Suppes. Retrieved March 16, 2013. ↑ "NYC baseball stadium subsidies: Do I hear $1.8B?". Field of Schemes. Retrieved May 28, 2015. ↑ "Bonus Season for Baseball". The New York Times. January 17, 2002. Retrieved May 5, 2010. ↑ "Yankees break ground on new $1 billion home". ESPN. Associated Press. August 16, 2006. Retrieved August 16, 2006. ↑ "New Yankee Stadium". Major League Baseball Advanced Media. Retrieved August 16, 2006. ↑ Lengel, David (April 17, 2007). "Yankees Dig Deep to Rid New Stadium of Curse". The Guardian. London. Retrieved May 5, 2010. ↑ "Jimmy Fund Auctions Buried Red Sox Jersey On eBay". WBZ. Boston. Associated Press. April 17, 2008. Retrieved July 19, 2008. ↑ "History of the Jimmy Fund". Jimmy Fund. Retrieved July 19, 2008. ↑ Schmidt, Michael S. (May 20, 2008). "Yanks May Be Scratching Surface of Sox Items at New Stadium". The New York Times. Retrieved January 16, 2010. ↑ Kernan, Kevin (November 10, 2009). "No Papi Jinx for Yankees". New York Post. Retrieved January 16, 2010. 1 2 3 4 5 6 7 "Tour the new House – Welcome Home". New York Daily News. Archived from the original on April 5, 2009. Retrieved April 10, 2009. ↑ "Tour the New House – The Daily News on Display". New York Daily News. Archived from the original on April 3, 2009. Retrieved April 10, 2009. 1 2 3 4 5 6 7 8 9 10 11 12 13 "Tour the New House – A Closer Look". New York Daily News. Archived from the original on April 5, 2009. Retrieved April 10, 2009. 1 2 3 4 "New Yankee Stadium Comparison". Major League Baseball Advanced Media. Retrieved September 26, 2008. ↑ Sandomir, Richard (April 14, 2009). "A Distinctive Facade Is Recreated at New Yankee Stadium". The New York Times. Retrieved May 5, 2010. 1 2 3 4 5 6 7 "Tour the New House – Hall of a Place". New York Daily News. Archived from the original on April 3, 2009. Retrieved April 10, 2009. ↑ Brown, Maury (December 19, 2007). "Daktronics: Video System for New Yankee Stadium". Biz of Baseball. Retrieved December 19, 2007. ↑ Abraham, Peter (June 17, 2009). "Dog Bites (Krazy) Man". The Journal News. Retrieved June 17, 2009. ↑ Coffey, Wayne (February 25, 2009). "Babe Ruth, Other Monuments Settle in New Yankee Stadium Home". New York Daily News. Retrieved March 1, 2009. ↑ Yes Network broadcast of Yankees vs. Cubs, April 3, 2009. 1 2 "AccuWeather: Smaller Stadium Causes HR Surge". Newsday. Associated Press. June 9, 2009. Retrieved January 16, 2010. 1 2 3 4 5 Kepner, Tyler (April 20, 2009). "Over the Wall and Under the Microscope in the Bronx". The New York Times. Retrieved May 23, 2009. ↑ "Kansas City Royals to Get 'World's Largest' HD LED Scoreboard". End Gadeget. October 3, 2007. Retrieved May 18, 2009. ↑ MJD (June 12, 2008). "Jerry Jones Aims to Make All Cowboys' Fans Blind by 2010". Yahoo! Sports. Retrieved November 28, 2008. ↑ Fraser, Adam (January 21, 2011). "Daktronics Takes Phillies' Screens to Next Level". SportsPro Media. Retrieved January 21, 2011. 1 2 3 4 5 "Tour the New House – Inside the Clubhouse". New York Daily News. Archived from the original on April 5, 2009. Retrieved April 10, 2009. 1 2 3 4 "Tour the New House – Pinstripe Pride". New York Daily News. Archived from the original on April 5, 2009. Retrieved April 10, 2009. ↑ Bloomberg News (June 18, 2008). "New York Yankees-Owned Steakhouse Will Be Part of New Stadium". New York Daily News. Retrieved January 16, 2010. ↑ Best, Neil (February 24, 2009). "Old Yankee Stadium's Obstructed Views Make a Comeback". Newsday. Retrieved January 16, 2010. ↑ Best, Neil (February 25, 2009). "Yankees Lower Partial-View Seat Price to $5". Newsday. Retrieved January 16, 2010. 1 2 3 4 5 Green, Sarah (May 5, 2009). "New Yankee Stadium Strikes Out With Customers". Harvard Business Review. Retrieved May 7, 2009. 1 2 3 Kepner, Tyler (May 6, 2009). "New Home, New Atmosphere". The New York Times. Retrieved May 7, 2009. ↑ Miller, Scott (October 29, 2009). "Yankees Create No Excitement, and Now Pressure's On". CBS Sports. Retrieved October 31, 2009. ↑ Best, Neil (October 29, 2009). "Empty Seats at Yankee Stadium Not What They Seem". Newsday. Retrieved October 31, 2009. ↑ "#1 New York Yankees". Forbes. March 23, 2011. ↑ "2015 Full Season Ticket License Pricing". New York Yankees. Retrieved May 28, 2015. 1 2 3 4 Gagne, Matt (May 6, 2009). "Fallout From Yankeegate Lingers with Stadium Workers, Irate Fans". New York Daily News. Retrieved May 7, 2009. ↑ Rashbaum, William K.; Belson, Ken (October 23, 2009). "Cracks Emerge in Ramps at New Yankee Stadium". The New York Times. Retrieved October 24, 2009. ↑ Raissman, Bob (July 30, 2012). "ESPN critiques of new Yankee Stadium keeps building on broadcasts". New York Daily News. Retrieved July 31, 2012. ↑ Passan, Jeff (October 15, 2012). "Yankees Deserve Boo-Birds and Empty Seats After Looking Like $200M bust in ALCS". Yahoo! Sports. Retrieved October 15, 2012. ↑ "Mo Rivera: Old Yankee Stadium Had Far Better Atmosphere Than New One « CBS New York". Retrieved May 28, 2015. 1 2 3 Olney, Buster (April 21, 2009). "New Yankee Stadium on Steroids?". ESPN. Retrieved May 23, 2009. 1 2 Matthews, Wallace (May 20, 2009). "Home Runs a Cheap Thrill at Yankee Stadium". Newsday. Archived from the original on May 25, 2009. Retrieved May 23, 2009. 1 2 "Yankee Stadium: Biggest Joke in Baseball". New York Post. Associated Press. May 22, 2009. Retrieved May 23, 2009. ↑ Keown, Tim (April 28, 2009). "Trouble at the House that George Built". ESPN. Retrieved May 23, 2009. ↑ Roberts, Jeff (May 23, 2009). "Ruthian Blasts Now a Common Sight". North Jersey Media Group. Retrieved May 23, 2009. ↑ McKee, Don (May 21, 2009). "Bronx Launching Pad Awaits Phils". The Philadelphia Inquirer. Retrieved May 23, 2009. ↑ "Phillies' Ruiz Finishes Yanks in 11th, Takes Lidge Off Hook". ESPN. Associated Press. May 29, 2009. Retrieved May 29, 2009. ↑ Olney, Buster (May 23, 2009). "Too Many Homers to Right? Add a Chicken Coop". ESPN. Retrieved May 23, 2009. 1 2 Feinsand, Mark (April 21, 2009). "Homer's Odyssey: News Tries to Solve New Yankee Stadium's Quandary". New York Daily News. Retrieved May 23, 2009. 1 2 3 Dittmeier, Bobbie (June 10, 2009). "Study: Design Cause of Stadium Homers". Major League Baseball Advanced Media. Retrieved June 10, 2009. ↑ Sciacco, Steve (August 11, 2009). "The New Stadium's a Bandbox". Yankee Analysts. Retrieved March 16, 2013. ↑ Hoch, Bryan (September 14, 2009). "Guerrero's Homer Sets Yankee Stadium Mark". Major League Baseball Advanced Media. Retrieved September 17, 2009. ↑ "Major League Teams, 2009". Fangraphs 2009 Splits by Team. Fangraphs. Retrieved June 25, 2011. 1 2 "Ballpark Detail". Hit Tracker Online. Retrieved March 16, 2013. ↑ "2011 Major League Baseball Season Summary". Baseball Reference. Retrieved March 16, 2013. ↑ Kepner, Tyler (April 16, 2009). "Getting Ready for the Real Thing". The New York Times. Retrieved April 16, 2009. ↑ "Cleveland 10, New York 2". USA Today. April 16, 2009. Archived from the original on April 20, 2009. Retrieved April 16, 2009. ↑ DiComo, Anthony (September 12, 2009). "Jeter Passes Gehrig with 2,722nd Hit". Major League Baseball Advanced Media. Retrieved April 15, 2011. ↑ Britton, Tim (August 4, 2010). "A-Rod Youngest in History to 600 Homers". MLB.com. Retrieved September 5, 2011. ↑ Hoch, Bryan (July 9, 2011). "With Homer, Jeter Joins 3,000-Hit Club". Major League Baseball Advanced Media. Retrieved July 11, 2011. ↑ Hoch, Bryan (August 25, 2011). "Yanks Rout A's with MLB Record Three Slams". Major League Baseball Advanced Media. Retrieved August 26, 2011. ↑ Taube, Aaron (September 19, 2011). "Rivera New Saves King as Yanks Top Twins". Major League Baseball Advanced Media. Retrieved July 21, 2011. ↑ "Train Service to MTA Metro-North Railroad's Newest Station Yankees – E. 153rd Street Begins Saturday May 23, 2009" (Press release). Metro-North Railroad. April 1, 2009. Retrieved January 16, 2010. ↑ "Events". SeaStreak. Retrieved December 18, 2011. 1 2 "N.Y.C. 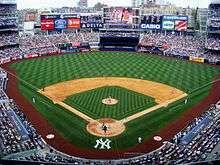 IDA Approves $325.3 Million, Most for Yankee Stadium Garages". The Bond Buyer. October 10, 2007. Retrieved October 10, 2007. ↑ "More Soccer At Yankee Stadium: AC Milan vs. Real Madrid In August!". Gothamist. May 24, 2012. Retrieved May 23, 2012. ↑ "Spain 2 Republic of Ireland 0". Daily Mail. London. June 12, 2013. Retrieved June 12, 2013. ↑ "Yankee Stadium Dimensions Cramping New York City FC's Style". Wall Street Journal. New York City. Retrieved May 28, 2015. ↑ Gibson, David (April 19, 2009). "God's Will in Hard Times". New York Magazine. Retrieved January 16, 2010. ↑ Paddock, Barry (May 12, 2010). "'30 Rock's' Alec Baldwin Ditches Comedy for Emotional Speech to NYU Graduates at Yankee Stadium". New York Daily News. Retrieved March 16, 2013. ↑ "President Bill Clinton to Speak at NYU's 2011 Commencement". New York University. March 8, 2011. Retrieved April 30, 2011. ↑ Weichselbaum, Simone; Schapiro, Rich (June 6, 2010). "Yankee Stadium Slugfest: Miguel Cotto Beats Junior Middleweight Champ Yuri Foreman". New York Daily News. Retrieved June 7, 2010. ↑ Hoch, Bryan (July 20, 2009). "Yanks to Host Notre Dame-Army Game". Major League Baseball Advanced Media. Retrieved January 16, 2010. ↑ "Sanu Sets Big East Record, Rutgers Outlasts Army". The Wall Street Journal. Associated Press. November 12, 2011. Retrieved December 1, 2011. ↑ "First Pinstripe Bowl to Be Held Dec. 30". ESPN. Associated Press. March 9, 2010. Retrieved May 20, 2010. ↑ Klein, Jeff Z. (24 January 2014). "At Yankee Stadium, Rangers Will Share Glamour with Rivals". New York Times. Retrieved 26 January 2014. ↑ "Here's why the Yankees are getting rid of print-at-home tickets". Washington Post. Retrieved 17 March 2016. ↑ "New York City fans left stranded over ticket farce in Toronto draw". ESPN FC. ESPN. Retrieved 17 March 2016. ↑ "Nobody Could Get Into The NYCFC Game At Yankee Stadium Because Of The Yankees' Stupid Ticket Policies". Deadspin. Retrieved 17 March 2016. ↑ "Yankees exec gets snobby when defending new ticket policy". Yahoo! Sports. Retrieved 17 March 2016. ↑ "Yankees glad John Oliver is a paying customer". ESPN.com. Retrieved 10 July 2016. ↑ "John Oliver Offers Premium Yankees Seats for 25 Cents Apiece on 'Last Week Tonight'". Speakeasy (The Wall Street Journal). Retrieved 10 July 2016. ↑ "John Oliver sent 'riff-raff' dressed as unicorns and 'left sharks' to the Yankees game". Washington Post. Retrieved 10 July 2016. ↑ "StubHub Will Serve as Yankees' Ticket Reseller". The New York Times. Retrieved 10 July 2016. ↑ Isidore, Chris (27 June 2016). "Yankees reach deal with StubHub". CNN Money. Retrieved 28 June 2016. Wikimedia Commons has media related to Yankee Stadium.